Fancy a day out with old planes? You could go to the RAF Museum in Hendon, for nothing, or you could travel north to the Imperial War Museum's Cambridgeshire outpost. Set on a former WW1/WW2 airfield, Duxford is home to more than 200 historic aircraft, many of which are still airworthy. Even better not all of these aircraft are military, many are civil, including a prototype Concorde you can climb aboard. It's not a cheap day out (currently £17.50 for adults, free for children), but it is a lot easier to get to from London than I imagined. Visit on an airshow day, or a weekend in high summer, and you can expect Duxford to be packed. I picked midweek at the back end of February, and the place was anything but. A few families with littl'uns, a group of military types here to reminisce, a handful of retired couples, plus some enthusiasts (male, in pairs). Not forgetting the school trips, each younger rather than older, with one group dressed up in wartime gear as part of their history topic. But all easily avoided across several empty acres. 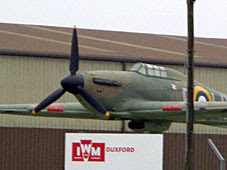 Duxford has eight exhibition spaces, of various enormousness, plus a variable number of planes laid out on the apron beside the main runway. It's a big place to wander around, as you'd expect from an airfield, but it's nothing too strenuous, and there's a mobility bus if all that sounds too much. 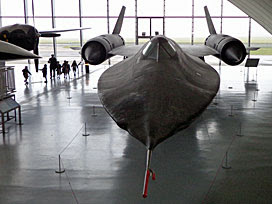 1) Air Space: This is the big one, a huge building opened in 2007 to house an exhibition and three dozen historic aircraft. 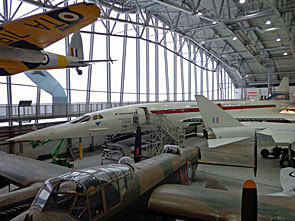 The exhibition tells the history of flight, in particular any aspect of flight with a British twist, so well done Britain. There are also plenty of buttons to press and gizmos to tweak, so this area is a magnet for any teacher with a class full of youngsters who need to let off steam in a vaguely educational manner. Watch out for a bit of the Wright Brothers' first plane in a case near the entrance. But you'll more likely be drawn in by the planes, arranged inside the hangar like a three-dimensional jigsaw. The smooth lines of a BOAC Comet, a capacious Lancaster, an arrow-blade Vulcan - stare and admire. And at the far end is the star of the show, an actual Concorde, that you can actually go inside. Volunteers were giving her a two-yearly clean while I was there, which meant a man with a sponge gently nudging a mechanical platform into place to give the nose a rub down. Don't expect first class luxury within - this was a prototype packed with recording equipment and never ferried paying passengers. But there are several rows of seats at the back, and an entirely unglamorous Concorde drinks trolley, all of which now have a whiff of the Easyjet about them. The slightly amateurish lettering on the tailfin and passenger door hint heavily that this plane never saw public service. But Concorde 101 still holds the record for a transatlantic crossing, that's 2hr 54m from Bristol to Newfoundland, and you can stroke her if you like on the way through. 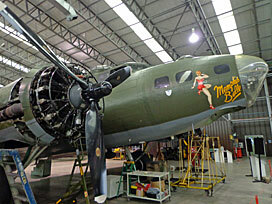 2) Flying Aircraft: That's not tautological, the vintage aircraft in this double-hangar really do still fly. An army of volunteers keeps them ticking over, and you might see one or two blokes in overalls busy soldering, or greasing, or whatever they do to keep a plane in the air, as you wander round. All these are privately owned too - the IWM owns only the key military stock outright. 3) Air and Sea: This is full of planes and boats, obviously, although it's a bit strange seeing boats and submarines miles from the sea in the middle of East Anglia. There are also helicopters, and jets with foldable wings that used to zoom off aircraft carriers, and several (functional) Spitfires. If you ever see one of those at a flypast, it quite likely came from here. 4) Battle of Britain: You can get quite blasé about Spitfires after a few hours at Duxford. Here they're joined by a wide selection of other wartime fliers, and the story of their plucky triumph is well told. It's also very cold in here - this is one of the unheated hangars - for that extra austerity touch if you visit in winter. 5) Conservation in Action: Another double hangar this, but with limited access, because it's essentially a workshop. This lot don't fly, indeed many have wheels rather than wings, but that doesn't stop devotees tinkering, bolting and polishing. That's even if the object of their attention is a V2 rocket - blimey they were big. 6) 1940 Operations Room: However Duxford try to dress it up, this is just an annexe with a table for pushing squadrons about with sticks. A worthy wartime warhorse, but (as the re-enactment broadcast over the speakers suggests) nothing Hollywood-worthy ever happened here. 7) American Air Museum: The US stumped up the money to build this one, a curved silver hangar set into a grassy mound. It's also huge - essentially the smallest building that could accommodate a B52, then with umpteen other American aircraft laid out inbetween. Yes, that's a Blackbird spy plane, and that's an F1-11, and that's a semi-critical audiovisual installation about the Gulf War. George Bush has visited - there's a plaque - and his country's contribution to the special relationship is duly commemorated. 8) Land Warfare: I didn't get this far. Well, nothing in this big shed flies, does it? And it's a long way down the airfield, and it'll be good to have something fresh to explore if I return. The "how to get here" page on Duxford's website has clearly been written by a car driver. With the museum located directly alongside Junction 10 on the M11, perhaps this road-friendliness isn't surprising. But if arriving by train the instructions suggest travelling to Cambridge, Royston or Whittlesford and then getting a taxi, making sure you've booked your return journey in advance. Don't. What the page fails to mention is that Whittlesford Parkway station is only a mile and a half from the museum, and that there's a perfectly decent footpath from one to the other. It's not entirely wheelchair friendly, but if you're relatively fit you can easily walk it in about half an hour. Head west out of the village, keep going as far as the motorway, cross at the roundabout and you're all but there. Or there is a bus from Cambridge, but it only runs on Sundays, and then only infrequently, so that's not recommended. I managed Liverpool Street to Duxford's main entrance in just under two hours for only the price of a return rail ticket, for the win.